A few years back, I was lucky enough to go to Barcelona with one of my greatest friends. We stayed at the cutest ever bed and breakfast and spent hours wondering thought Barcelona taking in the all things Gaudi and the sights, sounds and tastes of Barcelona. It was one of the best holidays of my life. Not just because I absolutely loved Barcelona and want to go back again and again. 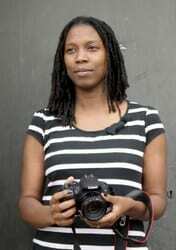 But because I was also pregnant with my eldest which just added to the specialness of the occasion. What it also meant though was that I was rather tired in the evenings. So I would just stay in the hotel whilst my mate would head out and get lost whilst hunting out the best that Barcelona had to offer for our supper. This was how we managed to eat one of the best ever falafels of our entire lives. Seriously, seriously good. We loved them so much that we both headed out to try and find the shop the next day but no luck. Seeing my friend E post her chickpea and almond meal falafels was just the kick I needed to try and recapture that moment in Barcelona. I knew the flavours would be great – I mean finely chopped chickpeas, cumin, almond, allspice and fresh coriander would just have to work right? And they did. 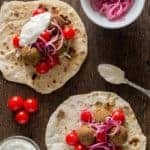 I served the baked falafels wrapped up in with some 5 minute yoghurt flat breads and piled high with pickled onions, tomatoes and tahini yoghurt sauce – it was a feast. 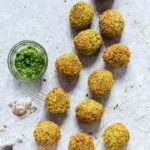 Please try these baked almond and chickpea falafels – they really are seriously, seriously good. And if you want more falafels then please try these baked quinoa falafel with a orange tahini dressing. 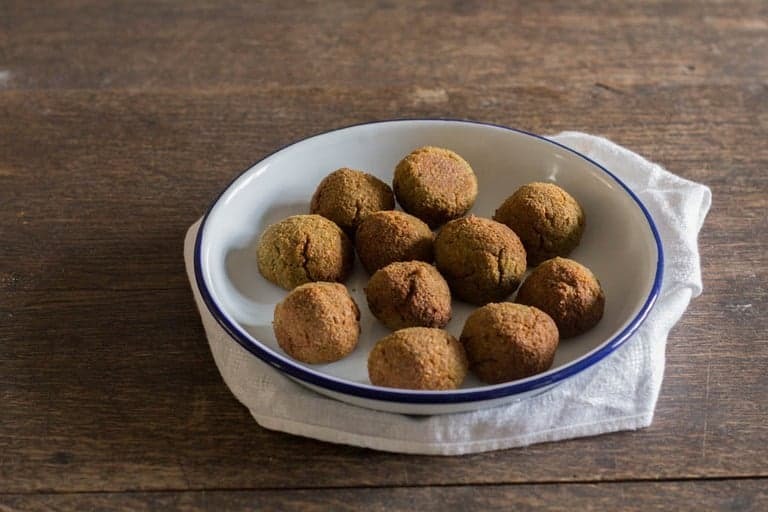 Don't forget to tag #recipesfromapantry on Instagram or Twitter if you try Baked Almond and Chickpea Falafels! It is really, really awesome for me when you make one of my recipes and I'd love to see it. You can also share it on my Facebook page. Please pin this recipe to Pinterest too! Thank you for reading Recipes from a Pantry. 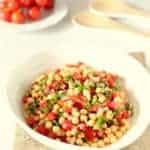 Add the chickpeas, garlic, onions and coriander into a food processor and whiz until the mixture is coarsely ground. Then add in the oil and pulse until the mixture is finely chopped but not mushy. Transfer the mixture to a bowl and add in all the spices, salt, baking powder and ground almonds and mix well. Adjust seasoning before refrigerating for 1 hour. Preheat the oven to fan assisted 170C / 190C / 375F / gas 5 and line a baking tray. 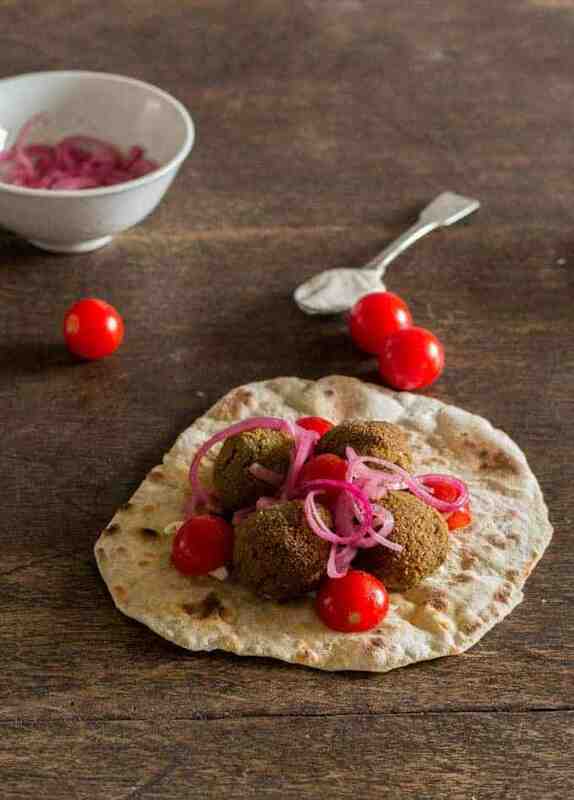 Wet your hands and roll about 2 tbsp of the falafel into a small ball and transfer to the baking tray. Repeat with the rest of the mixture until all done. Spray the falafels with some olive oil and bake for about 25 mins until golden brown and done. Mix all the ingredients for the tahini yoghurt sauce until well combined. 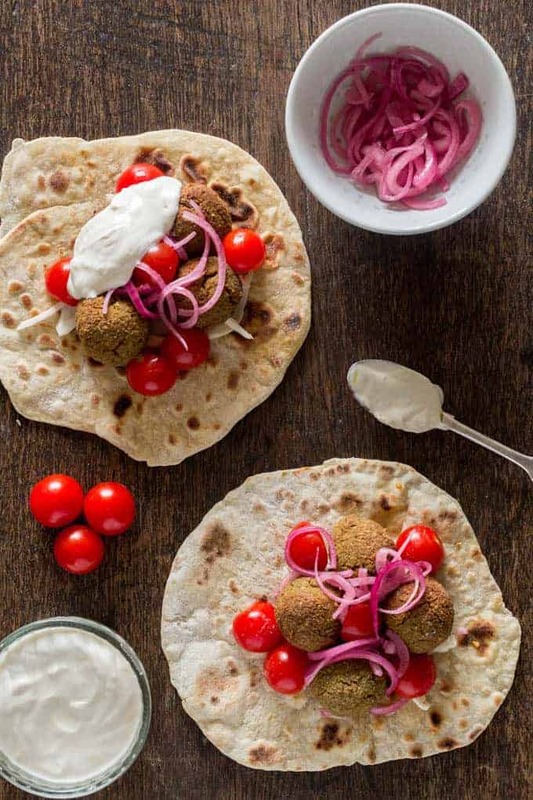 Serve the falafels with flatbreads, the tahini yoghurt sauce, along with some pickle onions and salad. Slightly adapted from Chickpea and almond meal falalels from The Whinery. I have been to Barcelona but not done everything so I am keen to go back. Your flatbreads look wonderful as do the falafel. I’m in the mood for this now! Stumbled, yummed and pinned. Aww, thanks masses. Very much appeciated. 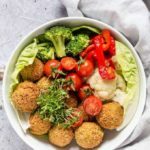 I love falafels and this is an interesting take on them, nice! I do love a felafel wrap, these sound fab! My husband would love this! Thanks for the great recipe! Sounds like a marvelous trip and the recipe looks positively delicious! Homemade falafel is the best!! These look so delicious; I must try them some time soon! These Falafels look adorable! I am saving the recipe for later! These Falafels look amazing. I can’t wait to bite into one! Making these this week! 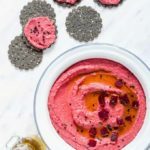 I love Falafel and this looks like such a flavorful way to serve them up! This is definitely my kind of dinner. I love falafel and you made it look so delicious! Besides the fact that Barcelona is my favorite city in the world your falafel is a fantastic recipe. Love it! What a great memory to have, and a great food memory to recreate. I love how healthy these are! My family will love them!